We've all seen the articles exposing how bad applying heat onto your hair is. But, how much do you actually know about the biological make-up of your hair? In this blog post, I'll briefly summarise what straightening, curling and diffusing actually does to your hair and then talk you through how to lessen the damage. Obviously, the best way to keep your hair healthy is to not apply heat at all. But, who's really gonna do that? So, what is hair made of? Your hair is made up primarily of a protein called keratin. This is made up of long chains of amino acids; these are the "building blocks" of every protein. The chain structure provides strength to the hair strand. Alongside these chains is another chain, this time, it's made of sulphur. These chains are bonded together to form disulphide bonds (hydrogen bonds are also present). These bonds start at the root of each hair. The bonds can be placed in a straight line down the strand of hair, or, they can be placed in a pattern. This is what determines whether you have curly/wavy hair or straight hair. This determination is actually already pre-determined by your genes. For those of you interested; curly hair is a dominant trait and straight hair is a recessive trait. The bonds between the keratin chain and the sulphur chain keep the hair in a fixed shape (curly, wavy, straight). Why is hair made up in this way? From a naturalistic and evolutionary point of view, this is the best possible way for hair to exist. Hair evolved to keep humans warm. Therefore, it needs to be strong and thick. The bonds within the chains account for the strength and the multiple chains account for the thickness. However, when people want to alter their hair shape (or even, colour), these disulphide and hydrogen bonds pose a little bit of a problem. That's why most techniques target these bonds. The aim is the break the bonds for an extended period of time so that the shape of the hair strand changes. As most of you will already know, the plates of a straightener and the rod of a curling iron are usually heated to around 230 degrees celsius. When the hair is passed through these plates or held against the rod, the extreme heat causes the bonds to break. This breakage allows the keratin chains to move around slightly and adapt the desired position; resulting in straightened or curled hair. When the hair cools down, the disulphide and hydrogen bonds between the chains are reformed. Because the keratin molecules have now adapted to a certain shape, the bonds form around this shape. You're then left with your desired hair-do! Now, we all know that straightening or curling your hair isn't permanent. When the hair is exposed to moisture, the bonds start to break again and reform into their "natural" shape. If you find that your hair style doesn't last all day, it probably because the chains in your hair have a higher affinity for moisture, which basically means that your hair absorbs moisture from the air quicker than what's deemed normal. So, a technique that I swear by for post-heat-styling is to blast your hair with your hair dryer immediately after straightening/curling using the cool setting. Because the heat of the iron breaks the bonds, you want your hair to cool down ASAP. Leaving your hair to cool naturally can usually take up to 15 minutes (depending on thickness). Using a dryer ensures that your hair is cooled within a minute or so. This allows the bonds to reform quicker; it also means that the bonds are broken for a shorter period of time, which lessens the damage. Another little ritual of mine is to deep condition. I deep condition every week, without a doubt. 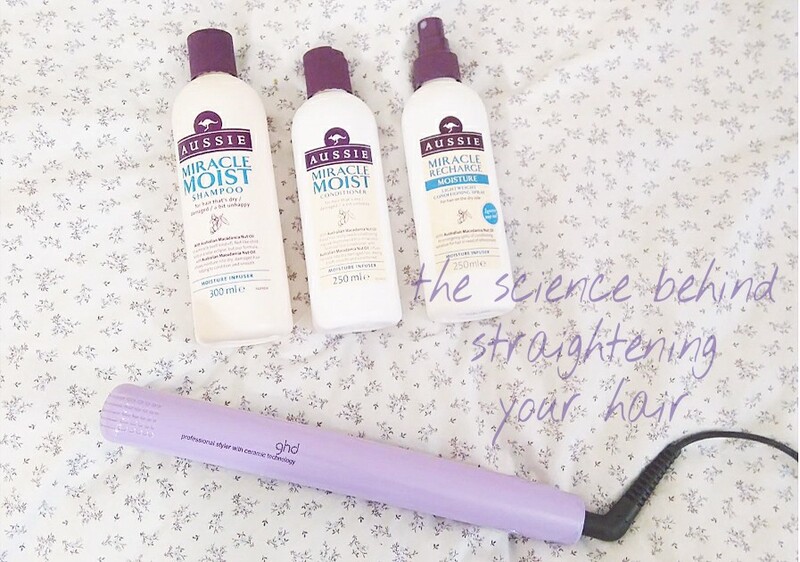 I use Aussie Miracle Moist leave-in conditioning spray (alongside their Miracle Moist shampoo, conditioner and deep conditioner). I love this range. It smells heavenly, it does the job and it's almost always on offer at Boots. It worked wonders when I had bleached, blonde hair and it still works wonders now that I'm brunette again. One of my no-no's is 2in1 shampoo/conditioner. They never work! Shampoo and conditioner are completely different formulas and you will not end up with the sleek, soft, healthy hair you're after if you use a 2in1 product. Condition the hell outta your hair. You'll feel the benefits within a week or two, trust me.